I would like to present my experience in fighting the fatal disease in my date palm tree. 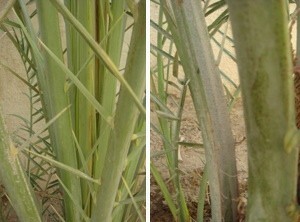 I have three date palm trees in my garden; two of them are same type, the third is different. I noticed the disease on the third. Two were greatly affected: The growth stopped, the green colour of the leaves began to disappear and changed into a dust-like colour. It is something sad to watch. As a solution to the problem, I decided to have my own remedy to the disease which is cloredine and water 1 to 40, I put the mixture into a sprayer. I started washing the leaves right from the top to the bottom of the tree heavily with the solution. I have repeated the action after two weeks. It is all over. The tree has recovered from the disease and it has got its liveliness. It began to grow and produce new green leaves. Picture 1 shows the tree. Look at the disease on the lowest part of the leaves in Picture 2. Picture 3 shows the crown of the tree: Look how it is safe and brilliant. Picture 4 shows the upper part of the leaves. See how it is green but the lowest part is rough and clumsy. I was very glad to participate in my own experience.